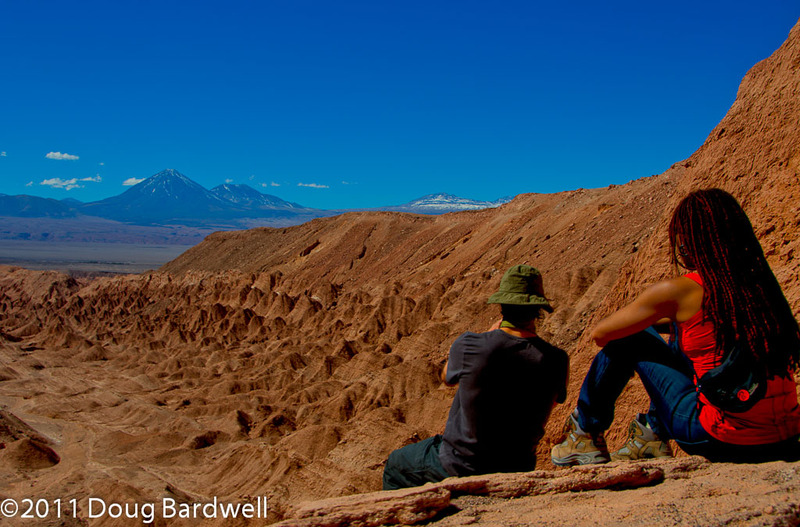 Unless you've been to the Atacama desert, you'll find that it redefines your understanding of the word "desert." Air so fresh, you smell nothing at all. Skies so clear, you'll never count all the stars. Rain is almost never in the forecast. Some areas here haven't had rain in over 400 years, and average rainfall in the general area is 0.04 inches per year. This is the Atacama desert. Don't let the word "desert" fool you though. This is not your typical inhospitable desert - quite the contrary. This desert maintains temperatures generally in the 70's and 80's. During the Chilean summer of January through March, it will rarely even get into 90's. In the evenings, a jacket will be welcome, as temperatures drop as much as 30 or 40 degrees. With the Andes Mountains on the east and the Chilean Coast Range on the west, this otherwise arid area has been compared to the landscape of Mars, so much so that Hollywood and NASA have been here many times. Rocks, hills, dunes and granular salt flats all add to the visual feast. Elevation is something to consider. 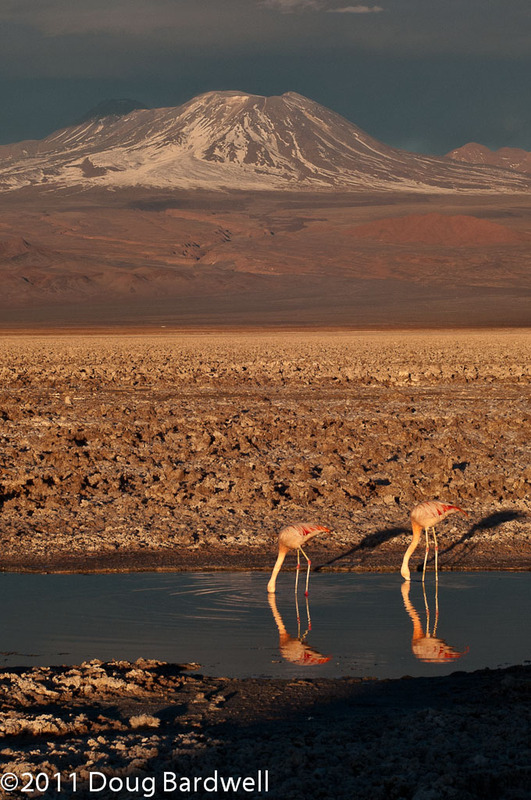 While Death Valley in the U.S. is actually partly below sea-level, the Atacama is considerably higher then Denver, starting about 7,000 ft., with much of the area rising to 9,000 ft. This can require a few days to acclimate yourself before you'll want to attempt any really strenuous activities. It's been waiting quite a while as a matter-of-fact. The church in San Pedro de Atacama has been here since 1577. The geoglyphs (geometric rock formations) have been here since 900 B.C. and the petroglyphs (art carved in rock) have been here even longer. With no rain, everything is perfectly preserved. So what can you do in the desert? Hiking Valle de la Luna (Moon Valley) and the Valley of Death opens the eyes to so many unique terrestrial formations, from stone, to sand to salt, in shapes that defy the imagination. Make sure you have your camera at sunset for lucsious light plays off the colored hills. Salar de Atacama (the salt flats) has the most unusual, thick textured granular covering of salt and lithium that only a photograph could describe. Los Flamencos National Reserve offers incredible views of three species of flamingos, and beautiful sunsets over the lake. Lagunas Cejar (Cejar Lagoon) is a lake with such a high concentration of salt, that it allows you to float like in the Dead Sea. Volcanoes sound interesting? 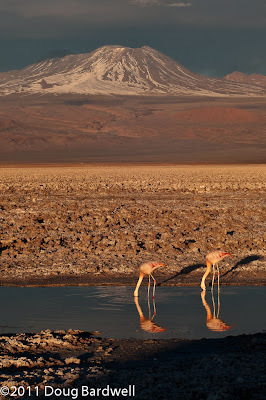 There are over 150 active volcanoes in Chile and some can be approached easily from the Atacama region. Want high adventure? Hike to the Tatio geysers for early morning eruptions of steam, high into the air. Bike through the local towns like San Pedro de Atacama or Toconao or out in the wilderness of desert. Need a traveling companion? 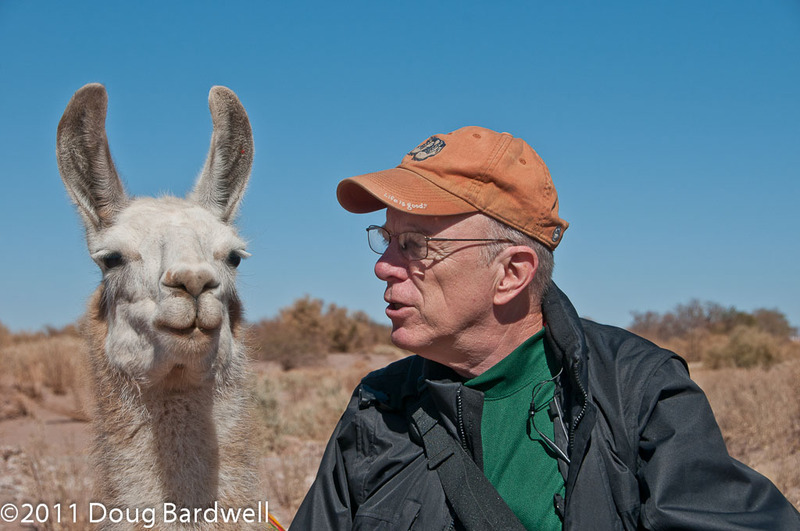 How about taking a llama for a walk through the desert? They make great traveling companions and they do well on a leash. Just the thought of activity making you hungry? Try a gastronomic tour of the local area given by the locals and learn native food preparation or take part in a local barbeque. Done for the day? Don't go to bed early, the night skies are something to behold. The giant ALMA telescope project won't open until 2014, but every night you can see more stars here with the naked eye than most anywhere else on earth.